If you’re looking for a stable and reliable family hatchback, then a used Toyota Auris is the car for you. Newer models boast a stylish exterior and technical updates that only add to the joy of owning one of these models. This car launched in 2007 and fit the higher end of the mid-sized cars but is still compact enough to be practical. With a hybrid model to follow, this car expanded its appeal and has been a successful car which is in full supply on the used car market. In the range of used Toyota Auris for sale at RAC Cars, there is plenty of choices. Just like all Toyota models, you get a reliable car that has high-build quality amongst plenty of other advantages. Efficiency and economy are what this model encompasses well, making them even more cost-effective to buy. There are engine sizes ranging from 1.3 litres to 2.2 litres, meaning you can enjoy even more choice when it comes to your next car. All of these features contribute to making this car a popular all-rounder that suits many purposes. 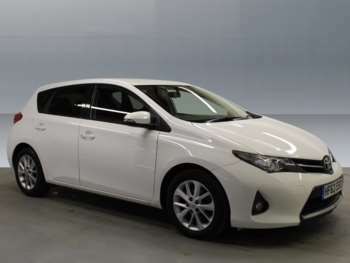 As mentioned earlier, Toyota has gone for efficiency and economy with the range of engines available on the Auris, which make for a steady and peaceful driving experience. What you get in terms of passenger comfort and family-friendly features will help to endear the Auris to you over those long miles on the road. Got a specific Toyota Auris model in mind?